Photo: Rainbow Lorrikeet, noisy but curious and friendly Australian birds. Visiting National Parks gives one the chance to spot all kinds of Australian birds and other fauna. 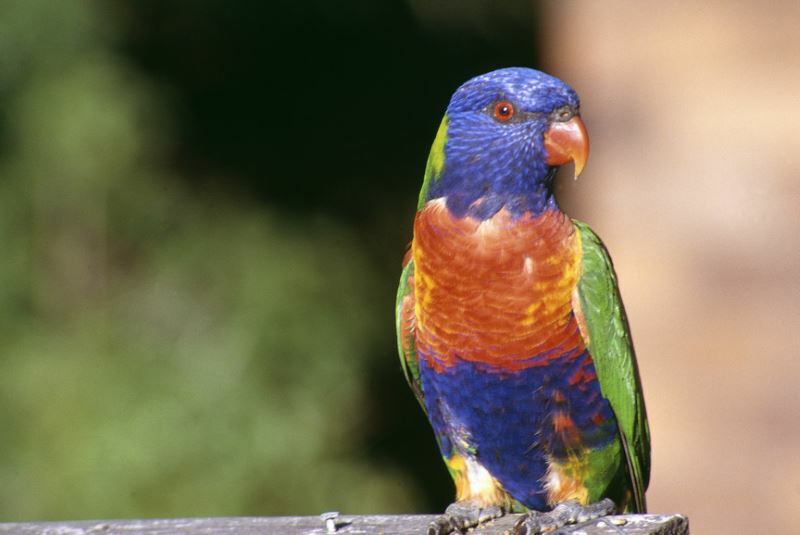 Others, such as the Rainbow Lorrikeet in the photo, live in all the coastal regions of Australia. Others only inhabit the inner regions. Some only live in very specific areas, about 300 species live only in Australia. That being said, to those that notice, you will see unique Australian birds even in the suburbs of the major cities. This can be attributed to the wide open spaces that still exist in the country. Many species of birds seen in Australia include those that can be seen in the Northern Hemisphere, or at least look similar. However they may have descended long ago from the same ancestors, but are now actually quite different. There are migratory birds that travel thousands of kilometres every year to their nesting grounds on different continents to and from Australia. About 450 species of birds visit this continent every year from Asia and as far away as Siberia. Laughing Kookaburra: A stocky bird with a long and wide bill, about the size of a crow with a short neck and a short tail. Birds play an important role in biodiversity, pollinating native plants and spreading seeds. Spotting these birds can take you through beautiful coastal scenery to the snowfields in the Australia alpine regions, the tropical rainforests of Queensland and the Northern Territory or the vast desert regions in the interior. Parrots can be found in many places in Australia, the variety of colours is fascinating to see in backyards and in parks. The musicality of birds like the whipbird and the lyre, who can imitate sounds and laughing kookaburras making hearing them a memorable treat. Main Photo: Rainbow Lorrikeet, noisy but curious and friendly Australian birds.